After a customer complained about his bag of carrot batons, Tesco asked him to elaborate. Shortly after that, they regretted it. Carrot aficionado Aaron Swift complained on Twitter that his carrot batons were terrible. Shortly after that, Tesco asked him to elaborate on his complaint. Bad idea. As a self-proclaimed carrot aficionado, Aaron was more than happy to elaborate. 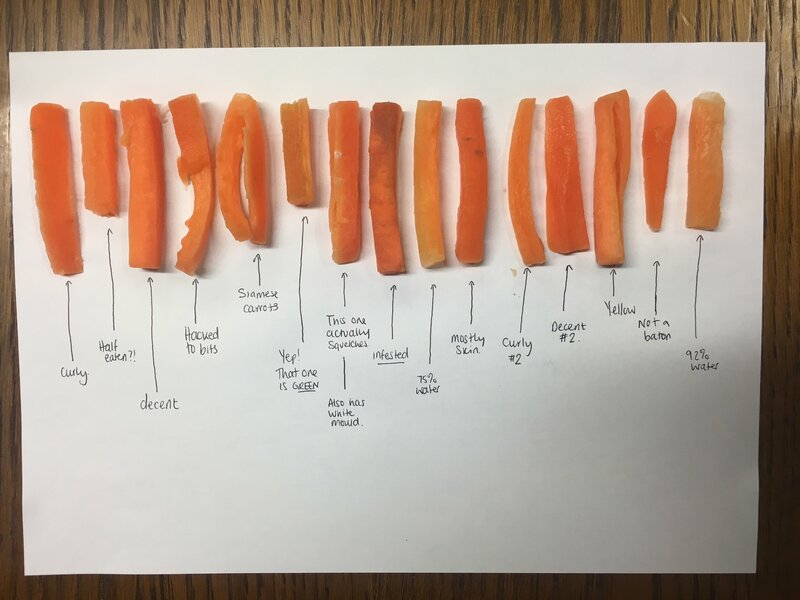 Then he labelled every last one of the bastards, explaining what was wrong with each individual carrot. In case you can't see that properly, here are the fully labelled travesties that Tesco's have been passing off as "carrot batons". Shortly after Aaron sent out his tweets, his carrot complaint went viral. On a day that the Chilcot enquiry came to an end, #carrotgate started trending on Twitter. @milpol1 @Retailbarcode @Tesco of course! They're sending me money so I can go buy more and repeat the experiment. We suspect they don't know what kind of hell they're in for.